this movie gets taken down from google video very quickly. watch it while you can. i think it's the best movie about the use of Depleted Uranium in the middle east. I got an e-mail from Aman Zafar and he said he re-scanned his pictures from 9/11 in the highest resolution. The pic is 15mb... so very good quality. it clearly shows that WTC 7 was not scooped out, as popular mechanics and NIST claims. I've made a few small changes in my paper. I've added the new information from the CNN transcript that shows that the White House evacuation began around the time that Mineta arrived at the White House. This confirmed his testimony when he stated that when he “got to the White House, it was being evacuated.” Thanks to Robert Moore for that find. This was essentially the only argument that the “debunkers” would use to ignore Mineta’s testimony since they maintained that the evacuation of the White House did not begin until 9:45. There is now essentially no counter argument to the testimony of Norman Mineta and the account of Richard Clarke. 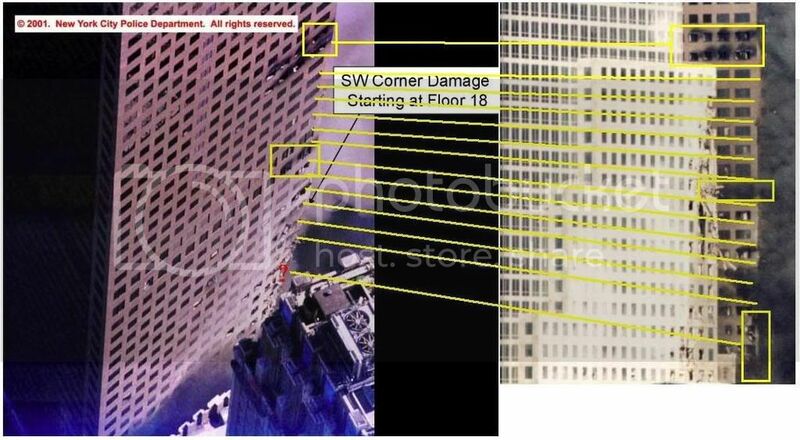 As far as i know, these are the only two pictures that show the SW corner of WTC 7 from the 18th floor down. I've added a couple new movies to my ever growing list of movies. I'd like to recomend some to everyone here that you may not have heard of yet, but are definately worth watching. Watch them before google takes them down... they've removed the first two movies before, but someone put new copies back up. If you want more... here's the list in all her glory. Five pages of movies and videos to watch off google video. There will most certainly be quite a few in there that you have not seen yet. What struck the Pentagon on 9/11? Many 9/11 researchers believe that the Pentagon was struck by a missile, a belief made widely popular by Loose Change. This theory is supported by the appearance of the Pentagon and the nature of the damage. The Pentagon was struck in the only section that was specifically renovated to bolster it against attack. This supports the theory that a missile was used to create the 16 foot hole since a drone aircraft would not cause significant damage to such a robust structure. Those who looked carefully at the debris at the Pentagon discovered evidence of airplane parts from a midsized aircraft, far smaller than AA 77, a Boeing 757. Although there are many conflicting eyewitness accounts, many seem to agree that it was a “mid-sized” plane that “appeared to hold about eight to 12 people”. Many have therefore speculated that it was an unmanned global hawk drone aircraft that was remotely piloted to strike the Pentagon. I found a few new documentaries to put up on my site... most of the new ones are on page 5, but there are probably a few that most of you havn't seen in the first 4 pages as well, so check out the huge list of movies i have now. Also, my paper on Norman Mineta is finished. Spread the link around and let me know what you think of the paper. If you think there's something i've overlooked, i invite anyone to help me expand and edit the paper. that's about it for now... my site isn't getting as many hits as it used to because it was the first link on the old st911.org site, and now a lot of people go to the new site. So if anyone is able to get my site more popular, that would be appreciated. a lot of people don't know about my site yet but would really like a lot of the content if they went to it. I screwed, ScrewLooseChange - DEBUNKED! I have finally come up with evidence that is 100% irrefutabale. My post about how Clarke and Mineta's accounts agree with each other proves Cheney was in the PEOC before the Pentagon was hit. Screw loose change people have a counter arguement for every claim that we make... but THEY CANNOT DEBUNK THIS! UNDEBUNKABLE - Mineta and Clarke Agree: Cheney was in the PEOC before the Pentagon was hit !